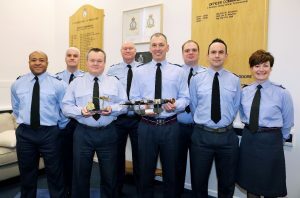 Number 605 (County of Warwick) Squadron (Sqn) RAuxAF, based at RAF Cosford, were recently delighted to receive two new items for their trophy cabinet. The first is “The Kemp Dirk” which is one of the annual trophies competed for by all the RAuxAF Squadrons. It is awarded to the Squadron which has achieved the best results in recruitment and retention over the training year. 2017/18 was a particularly successful year for 605 Sqn, with interest in joining consistently strong from across the West Midlands. 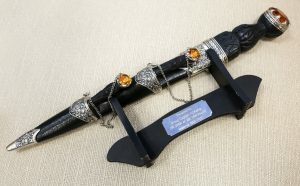 The trophy itself is in the form of a Scottish ceremonial dagger, known as a dirk and it was gifted by the former Inspector of the RAuxAF, Group Captain Bob Kemp – hence it is known as “The Kemp Dirk”. The trophy was presented to 605 Sqn by the current Inspector of the RAuxAF, Group Captain Gavin Hellard, at the Squadron’s annual formal dinner. A little more mystery surrounds the origins of the second trophy. 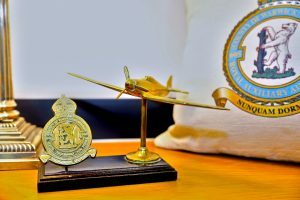 It is made of brass and consists of a model of a Hurricane aircraft, alongside the 605 Sqn crest, topped with a King’s crown. 605 Sqn flew Hurricanes during the Battle of Britain, and it is thought that the trophy was one of the Squadron’s internal awards, that was presented at that time. It’s return to the Squadron is down to the keen eye of a volunteer within the Cornwall Hospice Care charity, to whom the trophy was gifted by an anonymous donor. Mr Stephen Thompson works in one of the charity’s shops and is also a Cadet Force Adult Volunteer with number 1225 (St Austell & District) Sqn ATC. He recognised the significance of the trophy and contacted 605 Sqn to see if they wanted it back. Clearly, the Squadron was delighted to be reunited with a piece of its history and made a suitable donation to the Cornwall Hospice Care charity for its safe return.